I know the Godfather movies were mentioned on the previous thread but I don't remember the context. Melian, your scenario reminds me of the scene in the second (?) Godfather movie where Michael Corleone is asked to be godfather of his sister's child. While they are at the church, for the christening, the prearranged (by Michael Corleone) murder of all the other mafia don's commences. The statement issued from the White House regarding GHWB’s death. Q 2527 and Anon's take on what it means. Do get that impression, but Ive felt burned so many times before that Im sitting back trying to not get excited. I can sure identify with that. Guess a big chunk of me (not all) is an incurable optimist. I do. Seems like a pep talk before it all starts. I keep holding my breath waiting for it to start. Need to go help the husband with yard work and work off some nervous energy. Thanks. Agreed. Snow here. beautiful. >>Guess a big chunk of me (not all) is an incurable optimist. Thought I was too until joining this thread. If NASA never thought out of the box, or discussed the impossible, we would have never landed on the moon. What I mean to say is, just throwing things out there is a way to discovery. Some ideas are thrown away some are kept...none are written in stone. In regards to no name and HWB, nothing has been decided, just talked over. It is a good thing to not be narrow minded. After President Trump won the election in 2016, the Fed started a steady program of raising interest rates. Rates were increased seven times by the Fed since the 2016 election to their current 2%. How could we have been set free? What would set off seismic detection devices 11,000 miles away? How could something artificial create perfect waves with 17-second intervals? CERN? Though many discredited him, I still check him. There is something there. Thank you. 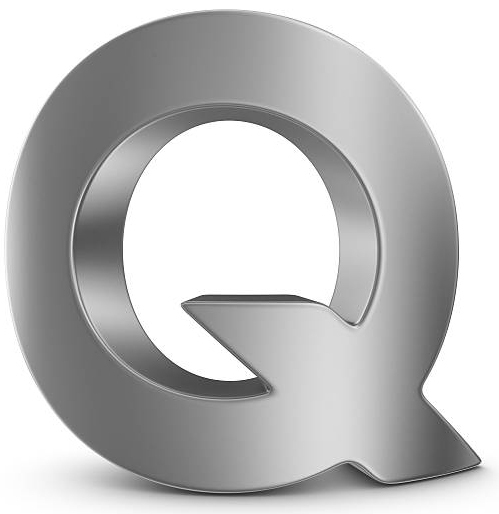 Interesting that Q chose to respond to ProfaneAnon. We see the different levels of thinking. 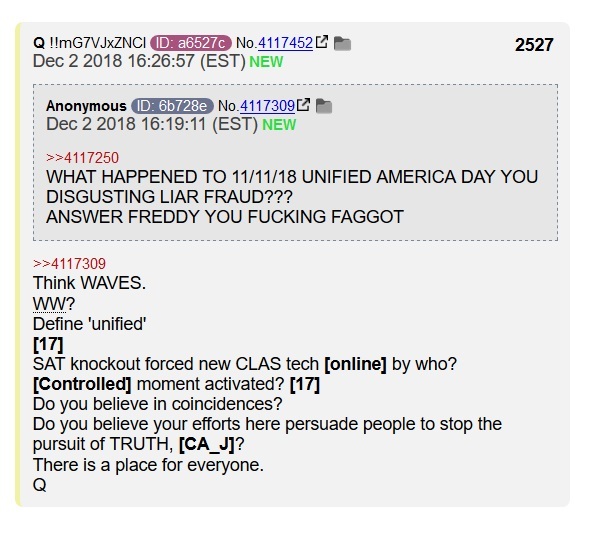 Q is thinking of a massive, unstoppable, worldwide movement (from the 40,000 foot level) and ProfaneAnon is hassling Q about one specific "prediction" -- that America would be "unified" on a specific day last month -- a prediction that Q didn't even make. 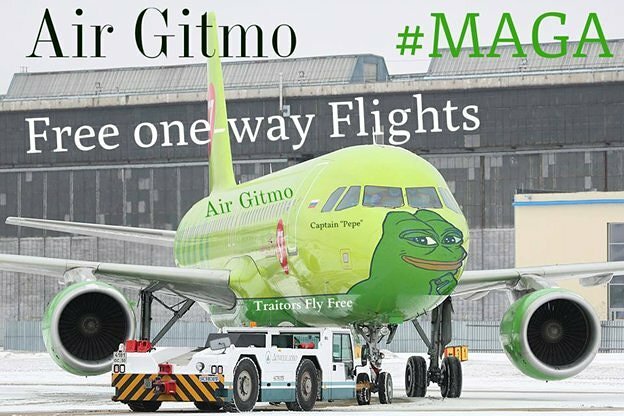 True, in Q1234 (4/21/18), Q juxtaposed the sentence "AMERICA WILL BE UNIFIED AGAIN!" with something that's arguably a date ("11.11.18"), but I don't think many thought that America would be unified again so soon. More info on waves on post 367. Maybe at those times, we do well to refocus on our Foundation, our Center, our Lord--and make sure that HE is our hope, peace, security etc. in our hearts and minds. At least we have read the end of the book and HE WINS, won at Calvary & the empty tomb. Nevertheless, these 'temporary' 'crucial' things sure can capture our attention, focus, concern. Am starting to deliberately focus elsewhere in intermissions of time just to keep SOME sort of perspective. LOL. CA_J prompted me to do a quick check on Jerry Brown. He’s just appointed 12 Superior Court judges and 4 Appeals Court Justices. See anon’s take on post 364 and link on 369. This movement is larger than anyone can possibly imagine.